Info "Kick back and unwind!" All Wound Up is a microgame in WarioWare: Smooth Moves that appears in Young Cricket's stage. The player must twist various objects. 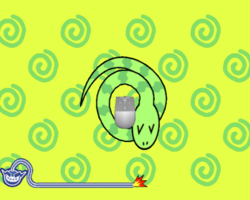 1st level difficulty: The player must twist one snake. 2nd level difficulty: The player must twist two snakes. 3rd level difficulty: The player must calm down a storm. Like BYOM, when played in the Temple of Form, this microgame will reveal a bonus after the third stage: the microgame Bungii!. Bungii! can be selected normally in the Remote Control group. On the third stage, the channel's name will be the player's name, for instance, "Channel Wario Weather". This page was last edited on February 19, 2018, at 19:15.